Leaving all of the objects listed below exactly where they are, moving only rocks and stones and dirt, and using transplants plus plants from tired out pots (for example, the yellow leaved camellias), plant a successful garden. Do this quickly, before your nerve fails. One 44 gallon drum - rusting, but full of rain water. 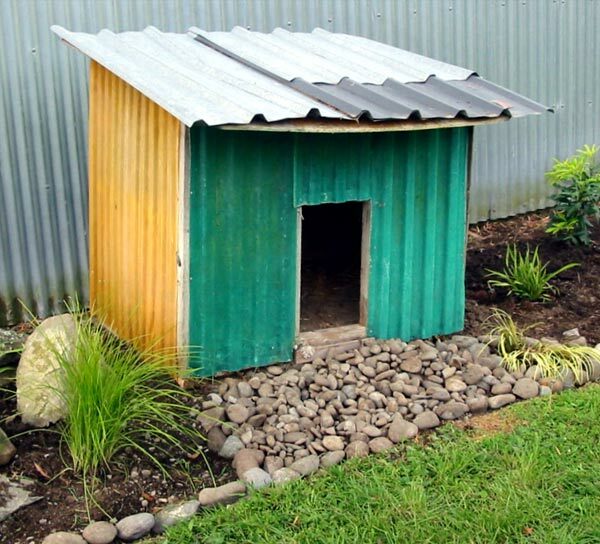 One home-made dog kennel - assorted materials. One large piece of railway sleeper wood - lying lengthways. One boring white bath - of no artistic value, full of rainwater. These can be rearranged, but not removed. Gravel - left over from unknown ex-owner's concrete making. Stones - lots of, small sizes, ex water race. The boring white bath - if desperate. Unpainted dull silver-grey corrugated roofing sheets. As long as you can forgive the yellowing Camellia leaves, and the large droopy rhododendron dragged from Middle Border, and the little grasses dug up from the vegetable garden (don't ask), you should be pleasantly surprised. The dry stream stone river bed flowing out of the door of the dog kennel is a masterstroke. And of course the red brick tones of the tussock theme echo the colours of the rusting oil drum. The green pseudopanaxes are set off by the sympathetic light grey background (we won't mention that one of them is already showing minor frost damage and will have to be shifted). 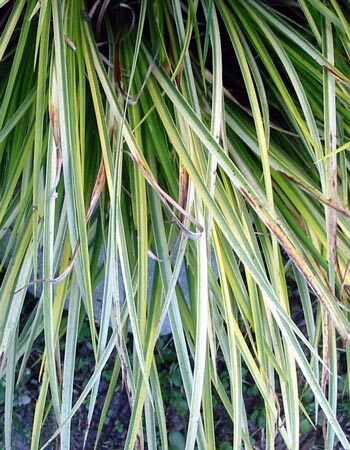 The Acorus grasses were never happy in their plastic bucket pots anyway - their label states 'moist conditions' quite clearly. The white bath is rightly considered both a water feature and an enduring domestic symbol - evoking memories of simpler times when rain water was prized for washing. Painting it cherry red was occasionally mentioned in the journal, but eventually considered counter-trendy. 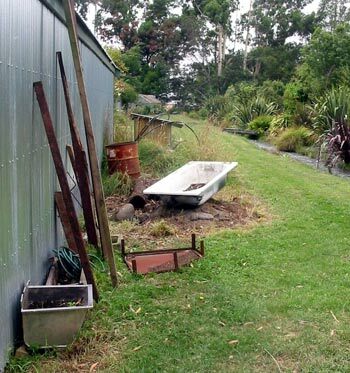 The whole project is a living work of heirloom art, and a daily reminder that it would have cost approximately thirty dollars to have taken all the stuff to the council dump and put down grass seed. Look out, Chelsea Flower Show! A new antipodean cutting-edge garden designer is born - a Moosey is on the loose!